Your breakfast game will be changed forever with this Keto Breakfast Coffee! You won't believe what we pack into this protein and fat heavy coffee... fine, we'll tell you. It's an egg yolk. Sounds crazy, we know, but it's a game changer for busy mornings! We've given you the makings for a 5 minute breakfast that will keep you full and satisfied until your next meal, whether it's lunch or dinner. Who Doesn't Love Coffee For Breakfast? Coffee is a must have in our household. We start off every morning with a powerful fatty cup of coffee no matter the day. While Matt can go all morning with just coffee and fat in his system, I on the other hand have a lot of mornings where I need something more filling to get me going on the right foot. And, that is where this breakfast coffee comes into play. I love sipping on something as I sort through emails and write blog posts, but now I can sip on my coffee and my breakfast too. 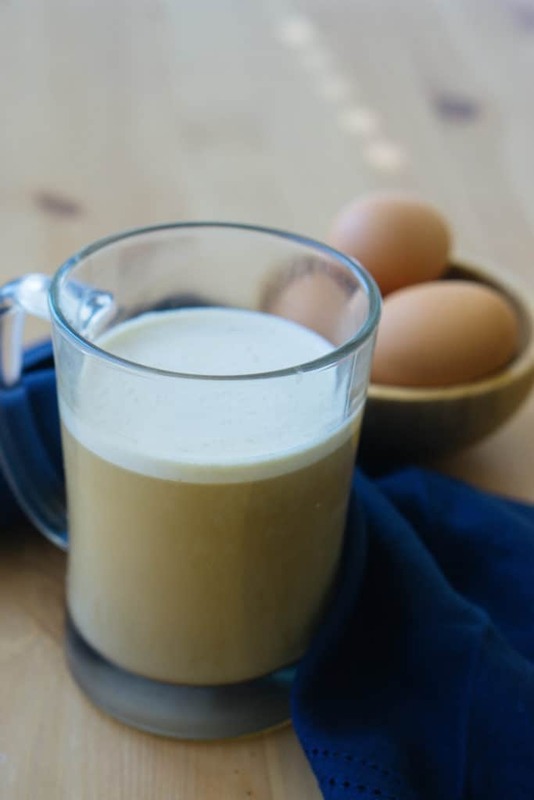 Packed with fat and protein I can make it until lunch with this breakfast coffee. Just like you, we are always on the prowl for easy breakfasts for our busy mornings, and this breakfast coffee is perfect for that! It's quick to throw together and take with you on the go in a to-go cup, and it will keep you full and satisfied until lunch. Some of our other favorite keto breakfasts for on the go are our macro muffins, bacon egg cups and breakfast cookies! They can all be prepared a week in advance and stored in the fridge for something easy to grab in the morning when you are rushing out the door. I've never been someone who can only have coffee for breakfast - I love food way too much! That was until now. 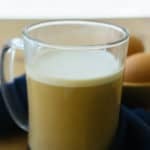 Matt recently introduced me to this keto breakfast coffee recipe that has changed the way I breakfast. Combining the caffeine from the coffee with the protein from the protein powder and fat from the whipping cream and yolk makes this the perfectly balanced breakfast to start my day off. 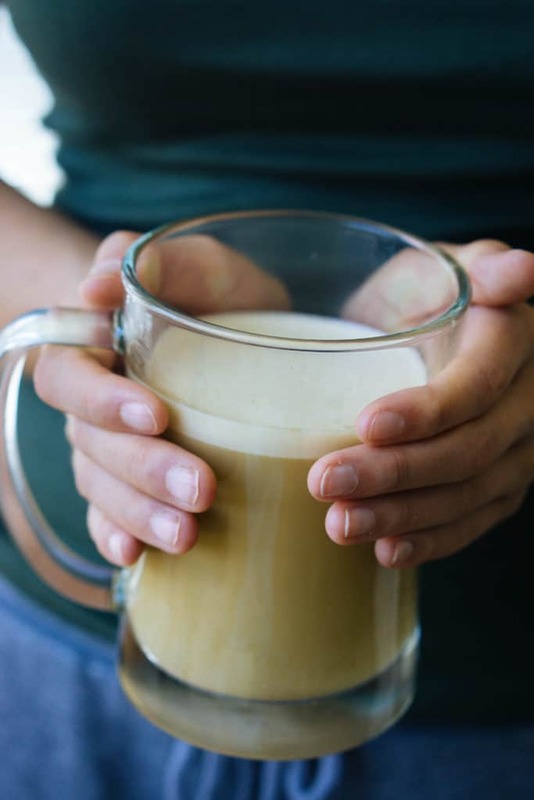 We highly recommend you at least give this keto breakfast coffee a try before you decide one way or the other! Recipe can be quickly added to MyFitnessPal - Search "KetoConnect - Keto Breakfast Coffee"
In a medium bowl add the heavy cream and egg and mix using a hand mixer to combine, about 30-45 seconds. Add the protein powder and stevia and combine once more. As you are mixing the cream mixture with the hand mixer slowly add in 2-3 tbsp of the hot coffee until fully incorporated. Pour the cream and coffee mixture into the coffee cup with the remaining coffee and stir to combine.